The Consumer Futures Unit (CFU) undertook extensive research to get to the root of the frustrating surcharges consumers face in parts of Scotland. This report summarises the findings, and makes recommendations for possible solutions. 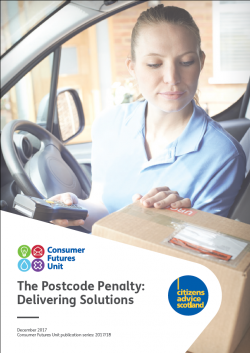 Residential and business consumers in some parts of Scotland are often asked to pay additional charges to have goods delivered, and attempts to address the problem have had limited impact. The issue affects anyone ordering goods to be delivered north of the central belt, including those in Perthshire, Aberdeenshire, Morayshire, Argyll and Bute, the North-West Highlands, and the Scottish Islands. We have referred to this area as “Highlands and Islands” for concision, although it includes some areas that may be considered outwith that region. Our primary recommendation following this research is that parcel companies should consider collaborating with each other and with the public sector to reduce their operating costs in the Highlands and Islands, driving down the prices charged to all consumers. We have begun to secure commitment from key industry and public sector representatives to work together on this, and hope to hold discussions in early 2018 to agree which solutions could be worth trialling. The research found that charges for parcel delivery are at least 30% higher on average for “Highlands and Islands” addresses than for other areas of mainland Great Britain. Those living on the Scottish islands are asked to pay over 50% more. We also found that the issue is not really a rural one in Scotland, as it affected centralInverness and even Aberdeen, as well as the rural north, but not other rural areas in southern Scotland, or in the rest of mainland Great Britain. The residential consumers that we surveyed overwhelmingly told us that they feel the surcharges are unfair. Parcel companies told us they see merit in exploring whether it would be feasible to set up networks of pick up and drop off locations in collaboration with the the public sector, in an effort to reduce cost. As well as the main summary report, which you can access by clicking the "Download Publication" button below, you can also explore the three technical reports, which go into the research methodologies used in more detail.